A year after we’ve reviewed the Ideapad 100 from Lenovo, we get to play around with the refreshed Ideapad 110 lineup, which hasn’t changed much in most aspects but receives a slightly re-designed chassis, a new updated processor and a lot better maintenance procedure that doesn’t require the keyboard to come off. 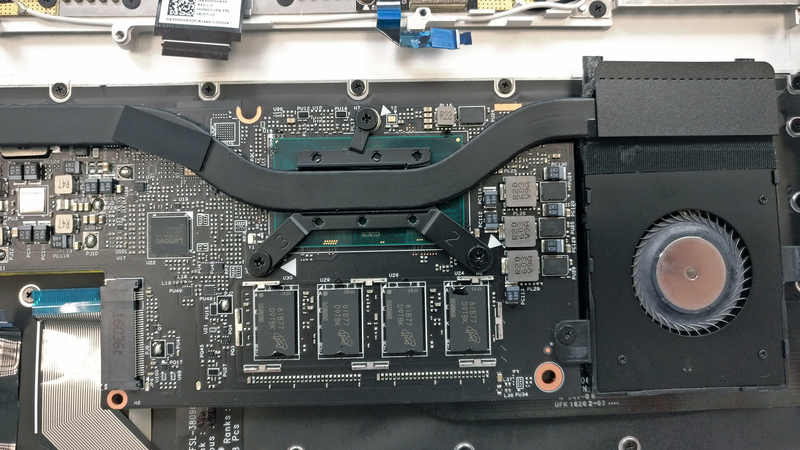 With the Ideapad 100 and Ideapad 110 being almost identical with little changes under the hood, it will be interesting to see how this has reflected on the user experience as a whole. Does the updated CPU maintain lower or at least the same temperatures as before due to the fan-less cooling design, does the display still have PWM and does it improve the overall picture quality and is there any battery improvements? We find out in the detailed review below. The retail package is modest containing only the user manuals, AC cord, and adapter along with the notebook itself, of course. 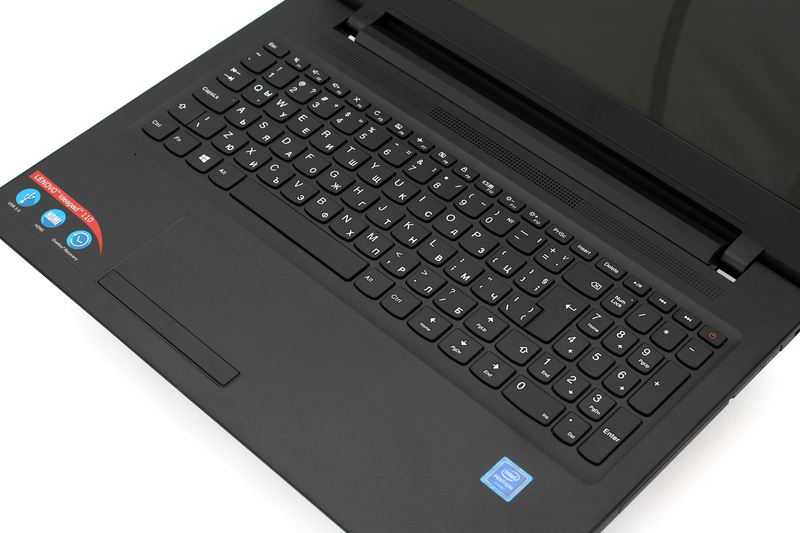 From a design standpoint, you can’t really expect a high-end chassis without compromises in the build quality but the Ideapad 110’s case seems to be pretty decent. 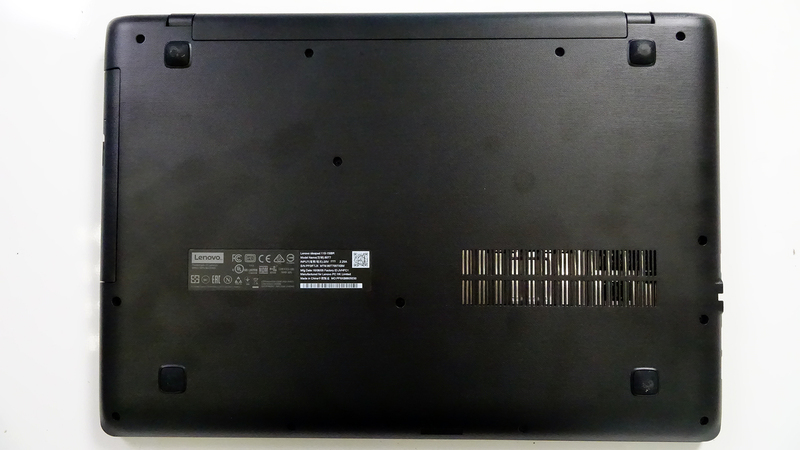 It’s also been updated with an interesting pattern over the surface, which wasn’t present in the previous Ideapad 100. Unfortunately, it’s still a huge fingerprint magnet so frequent cleaning is required. The lid feels pretty nice, smooth and “grippy” so it’s easy to carry it around. But as we mentioned, the fingerprints are quite prominent. The surface bends under pressure and causes ripples on the LCD screen but not as much as we expected, to be honest. By opening the lid you will feel that the hinges are a bit overly tightened towards the end and middle of the travel but turn loose in the beginning. So opening the lid requires both hands but one hand is enough just to lift it up. The good thing is that the bottom piece features the same finish without contrasting to the whole design signature. Something we see quite often on even higher-end laptops. There you will see only one big opening for extra airflow for the CPU. The sides integrate the bare minimum of ports with the left one adopting the HDMI, LAN, USB 2.0 and USB 3.0 connectors, 3.5 mm audio jack and the DC charging port, which is placed on an utterly awkward position – in the center. So the cable might get in the way sometimes. This is probably due to design limitations, as the motherboard is located near the bottom left of the base so the DC charging port,has to be somewhere nearby. As for the right side, it has only the optical drive in place. And as far as portability is concerned, the notebook hasn’t gone any slimmer than last year’s model – 22.9 mm at its thickest point vs the 22.6 mm height on the Ideapad 100. 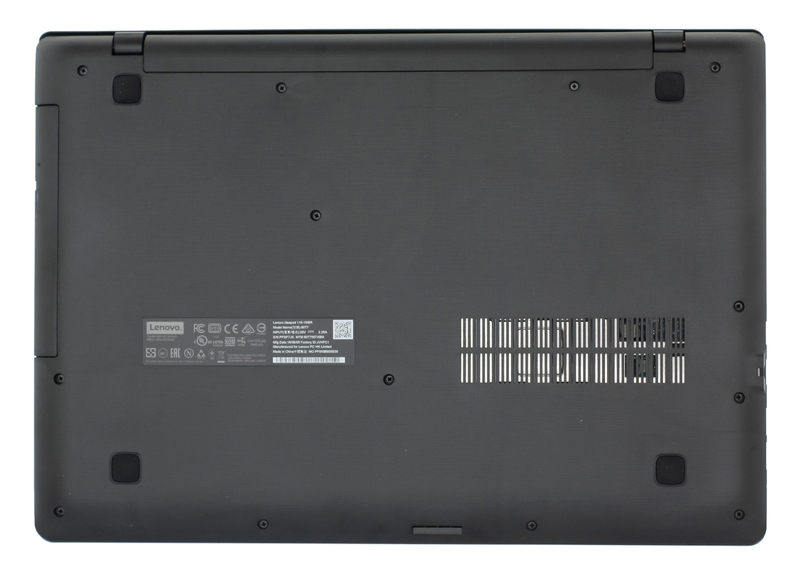 With a slightly different finish, the interior of the Ideapad 110 resembles faux leather to touch but it’s easy to see that it’s plastic. And despite the different finish, the plastic surface still attracts a lot of fingerprints. But what about the input devices? Well, the keyboard is decent for the price range but two things didn’t make a good impression. The short key travel is understandable but the feedback when pressing the keys should have been a little bit better. 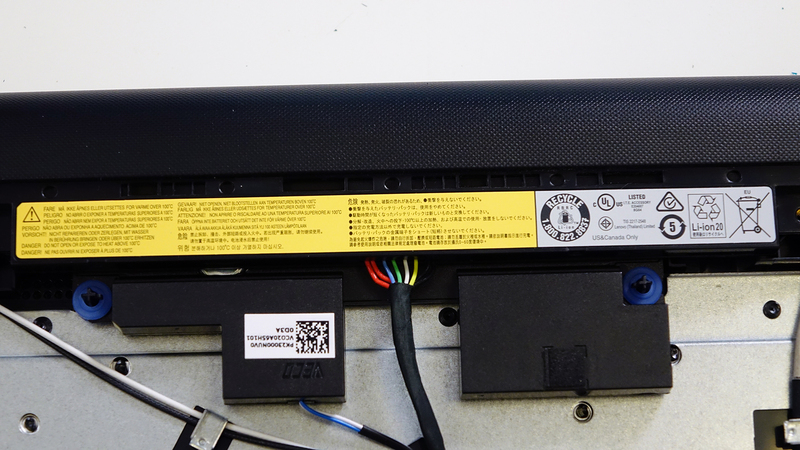 Also, the whole keyboard tray is a bit spongy and even the lightest press of a button causes the keyboard to sink. On the contrary, the wrist rest area is solid and rigid. The same goes for the trackpad area, which uses two stiff mouse buttons instead of a whole touchpad plate and we strongly prefer this design on a low-end machine for sure. 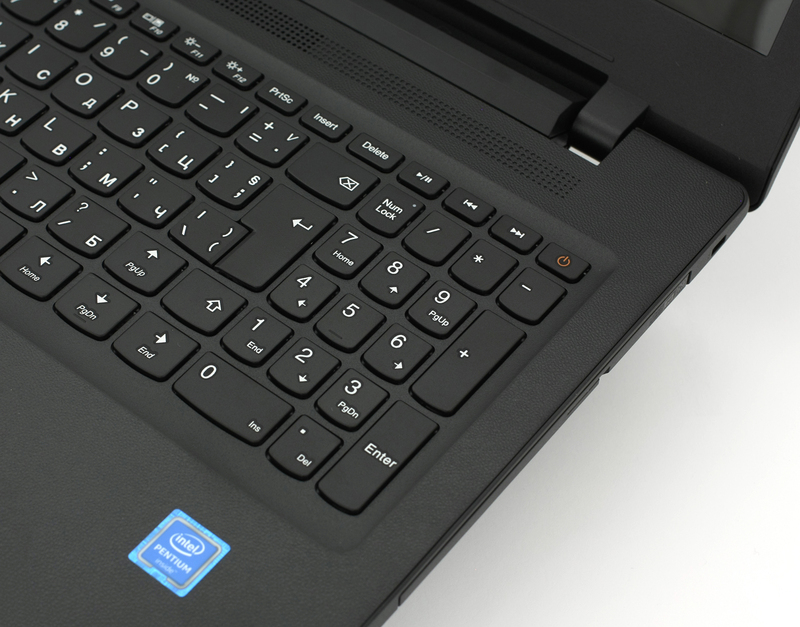 Usually, the entry-level notebooks have flimsy touchpad design so the one on the Ideapad 110 will suit most users pretty well. …and then proceed with the bottom piece. 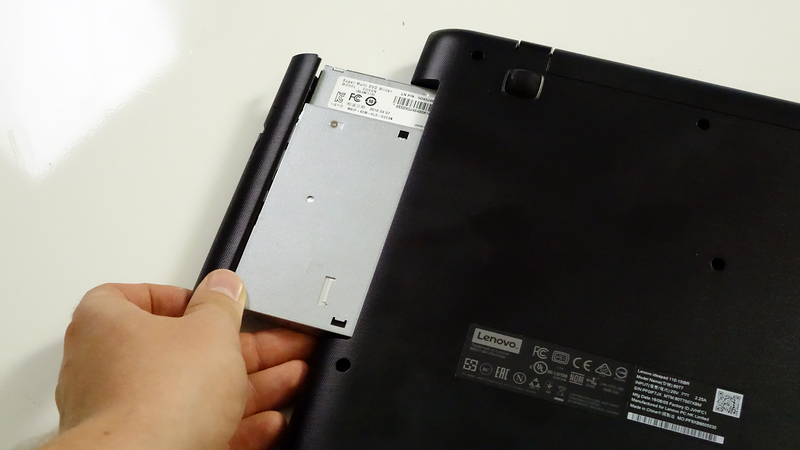 Quite expectedly, the Ideapad 110 houses one 2.5-inch drive slot usually taken by a 500GB or 1TB HDD depending on the configuration you will buy. 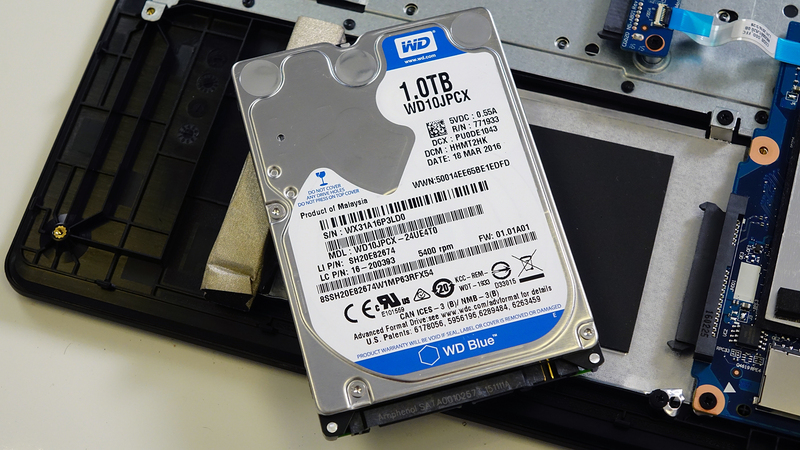 If this isn’t enough, you can always swap the 2.5-inch HDD for an SSD and stick the HDD into a caddy replacing the otpical drive. The RAM can’t be upgraded as it comes soldered to the motherboard. Make sure you choose the appropriate amount of RAM since it cannot be changed. 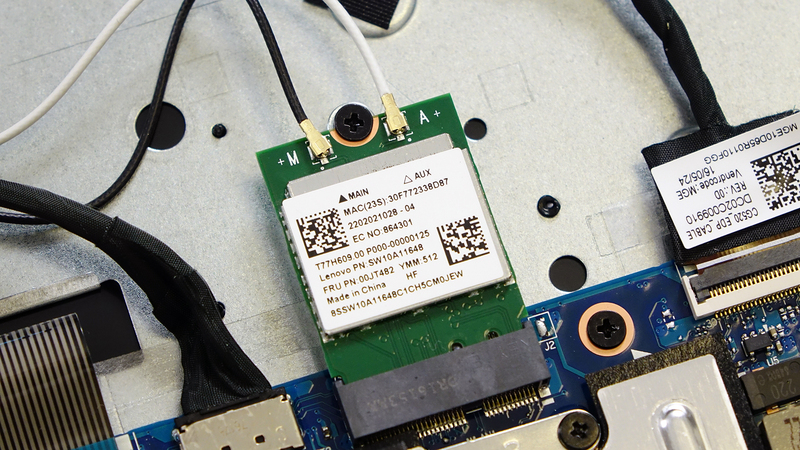 The Wi-Fi module is located right above the covering plate of the CPU. Its model number is SW10A11648. The battery is rated at just 24Wh and it’s located right between the screen hinges. 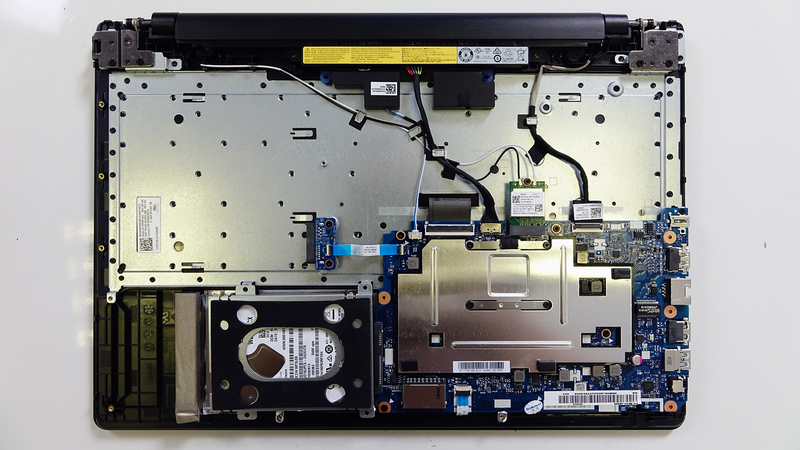 The Ideapad 110 uses a passive cooling system because the Intel Pentium N3710 allows it. You won’t find any fans – just a big heat sink and a thermal paste applied to it for heat dispersion. 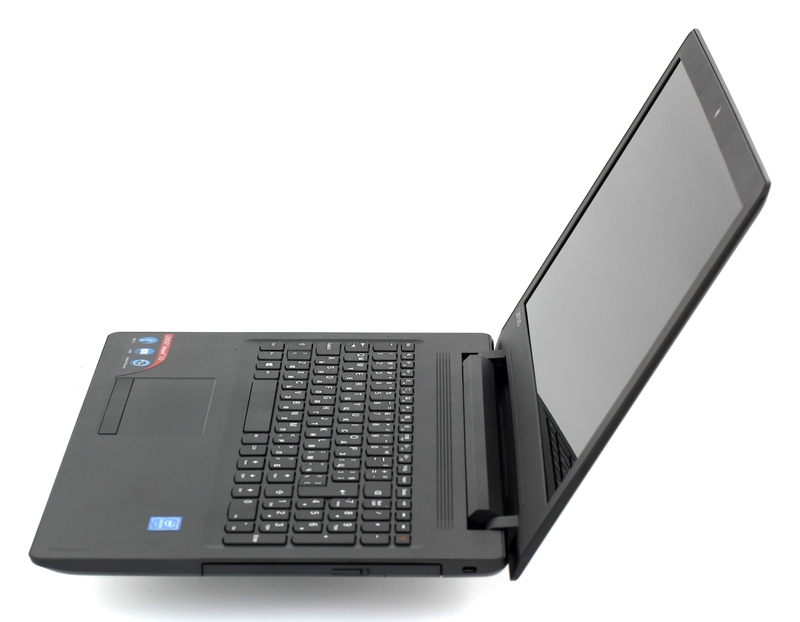 As a low-end machine, the Ideapad 110 uses a budget 15-inch WXGA TN panel with 1366 x 768 HD resolution. It’s manufactured by LG with model number LP156WHU-TPG1 and has pixel density of just 100 ppi and 0.253 x 0.253 mm pixel pitch. It can be considered as “Retina” when viewed from a distance equal or greater than 86 cm. There’s noticeable color shift from a 45-degree incline due to the TN panel as you can see in the photo below. As of color deviation, we’ve measured dE2000 of 4.2 in the lower left corner of the screen. Keep in mind that values above 4.0 are unwanted. 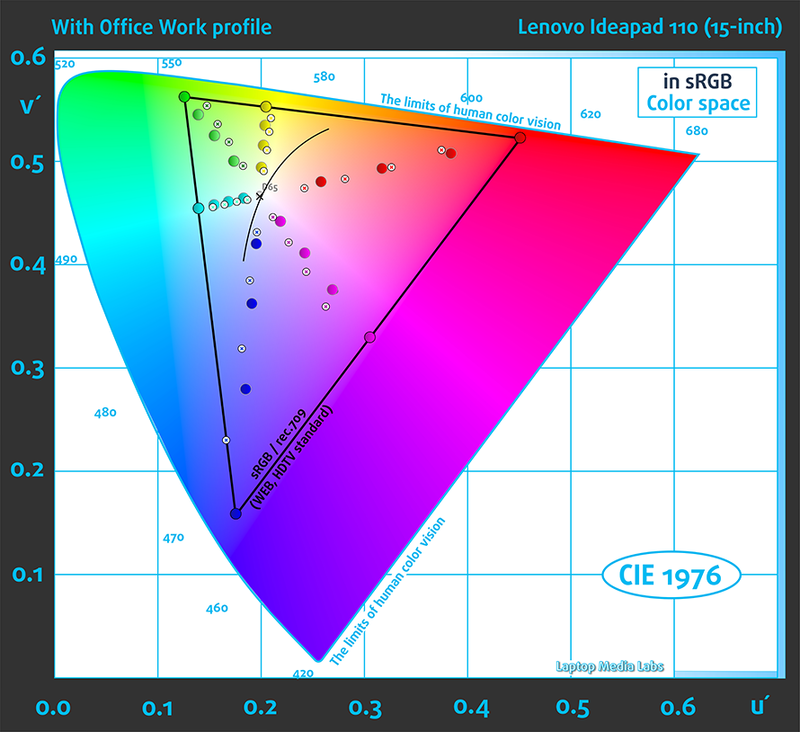 But as far as sRGB coverage is concerned, the display goes as far as 51% as shown in the image below. We’ve created the profile at 140 cd/m2, optimal white point (D65, 6500K) and sRGB gamma mode. We recorded Fall Time + Rise Time = 16 ms.
Our equipment was able to detect pulsations across all brightness levels but at extremely high frequency (40 kHz). This means that the display may have an impact on users with extra sensitive eyes, although it’s quite unlikely. We can consider it as user-friendly and safe to use for longer periods of time. However, if you happen to experience some eye soreness or a headache after prolonged use, you can always turn up the brightness to 100% where the flickering stops. The notebook’s TN panel isn’t the best one for multimedia purposes but it’s sufficient for the usual office work and web browsing. It has normal maximum brightness, sRGB coverage, contrast ratio and color accuracy for a machine at this price range. However, a big plus is the high-frequency PWM, which the screen produces. Although present, it should not affect users even with sensitive eyes during long hours of work. We didn’t notice any major distortions at low, mid and high frequencies but the maximum volume isn’t high enough. We used a freshly installed Windows 10 (64-bit) for the writing of this review. 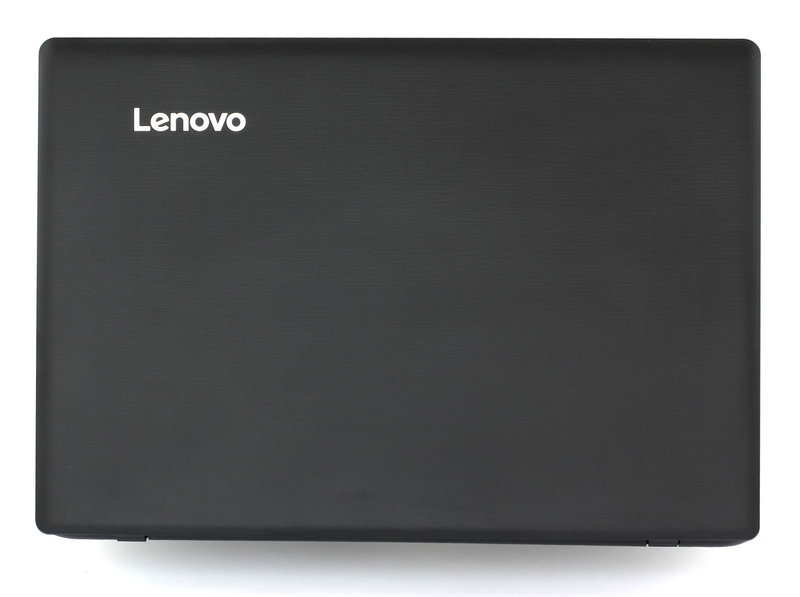 If you wish to do a clean install yourself as well, we suggest downloading the latest drivers from Lenovo’s official support page. We have mixed feelings about the battery life of this notebook because it’s one of the most affordable solutions out there so it’s hard to have any complaints. 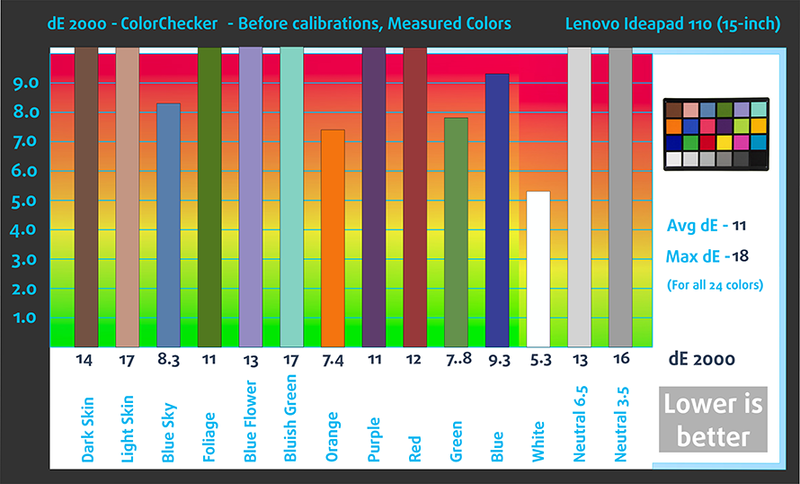 However, when we reviewed last year’s model with Intel’s Celeron N2840, we got slightly better readings – around 13 to 15% better to be exact. It must be the fact that the Celeron draws slightly less power than the Pentium. Battery capacity has remained the same, though – 24Wh. All tests were performed with the usual settings – Wi-Fi turned on, Windows battery saving feature turned on and screen brightness set to 120 cd/m2. The notebook scored merely 204 minutes (3 hours and 24 minutes) on the web browsing test, which was kind of expected. We got even lower result on the video playback test – 195 minutes (3 hours and 15 minutes). This test got the most of the battery since it’s the most demanding one – 62 (1 hour and 2 minutes). 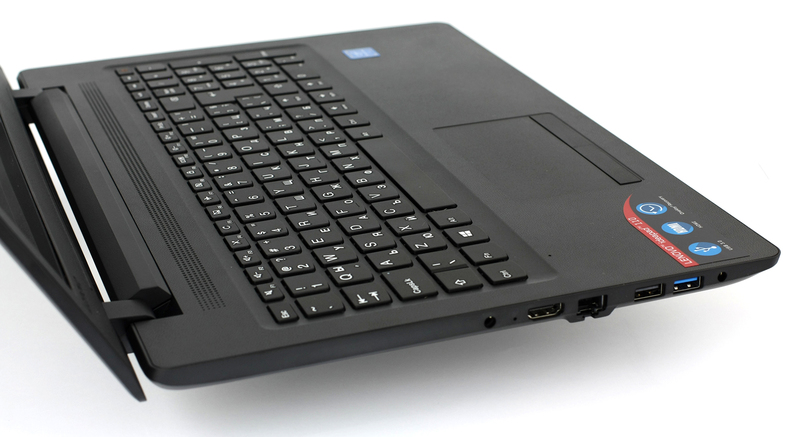 Intel’s Pentium N3710 is an entry-level SoC usually found in affordable notebooks. It features a quad-core design based on the 14nm manufacturing process with tri-gate transistors. This improves the overall energy efficiency and performance compared to the older Bay Trail platform. All four cores are based on the Airmont architecture and it’s pretty close to the previous Silvermont architecture so performance per clock isn’t improved as much but the new 14nm manufacturing process allows better utilization of the Burst frequency leading to better overall performance. Compared to the old Intel Pentium N3700, the N3710 successor reaches a maximum of 2.56 GHz and works at base 1.60 GHz frequency. The whole SoC – including the integrated Intel HD Graphics (Braswell) and the DDR3L memory controller – is rated at 6W TDP while the SDP is 4W. Keep in mind that since the chip uses a passive cooling design, its performance strongly depends on the implementation of each OEM. The chip should be sufficient for general work, browsing and in some cases even multimedia but will struggle with more demanding tasks and applications. 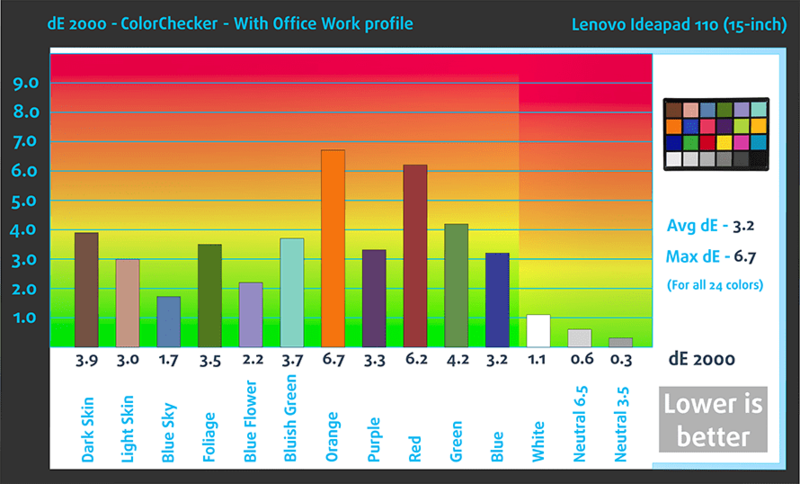 Here you can see an approximate comparison between the CPUs that can be found in the Lenovo ideapad 110 (15") models on the market. 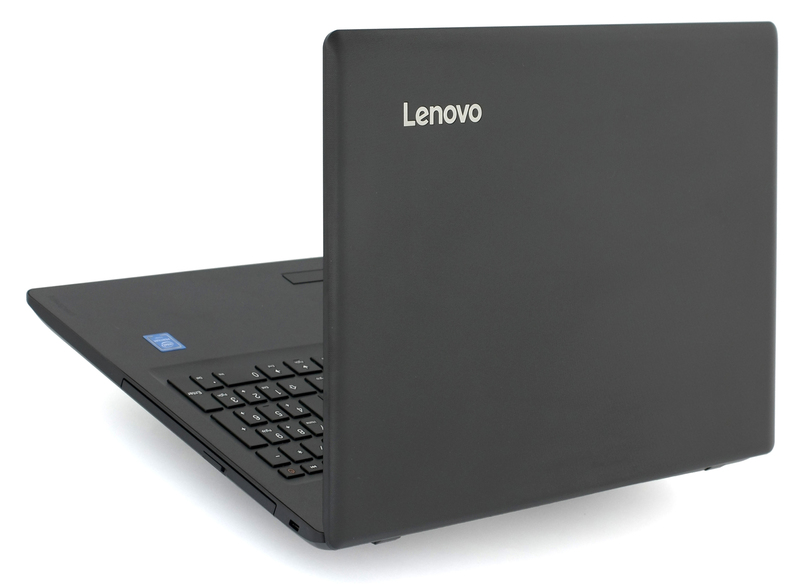 This way you can decide for yourself which Lenovo ideapad 110 (15") model is the best bang for your buck. Fritz is a chess benchmark that tests the computing capabilities of the CPU with various chess moves. The Intel Pentium N3170 scored 4.462 million moves per second. In comparison, one of the most powerful chess computers, Deep(er) Blue, was able to squeeze out 200 million moves per second. In 1997 Deep(er) Blue even beat the famous Garry Kasparov with 3.5 to 2.5. An integrated GPU used in all CPUs part of the Braswell generation. The GPUs frequency can vary a lot – from around 300MHz to up to 700MHz, depending on the model of the processor. 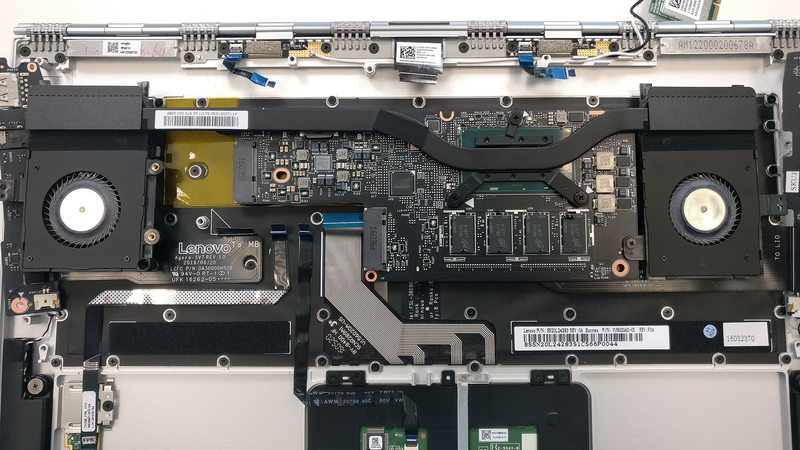 It has 16 EUs (Execution Units) and its architecture is almost the same as the one on the Core M CPUs (while the Core M’s graphics integrate 24 EUs). The GPU can support up to 3 displays with a maximum resolution of 4K, but internally can handle only 2560 x 1440 (QHD) via eDP. 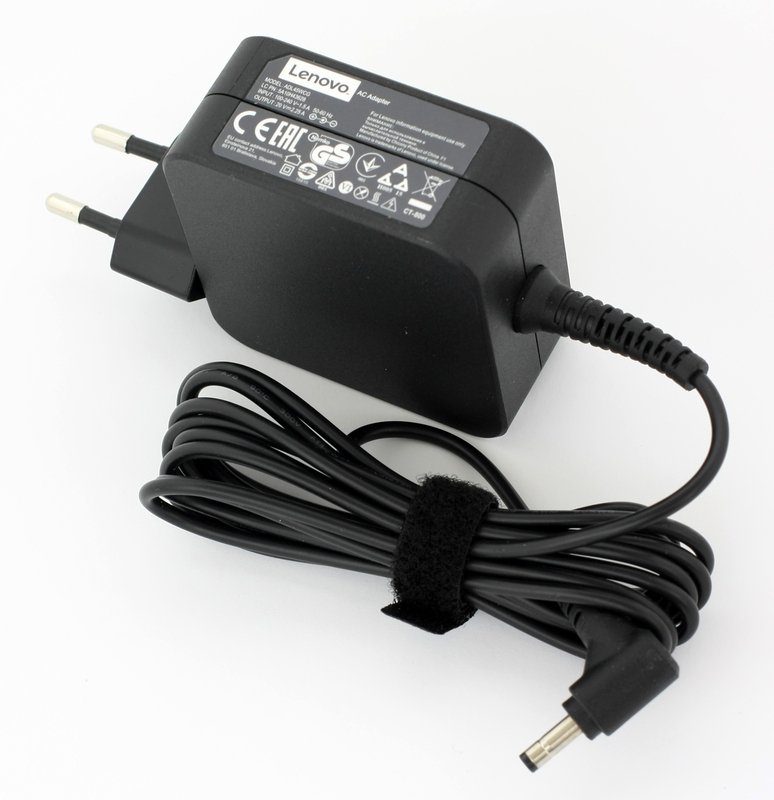 The external displays can be connected via HDMI or Display Port. Other major features include the support of DirectX 12 and Open GL 4.2. 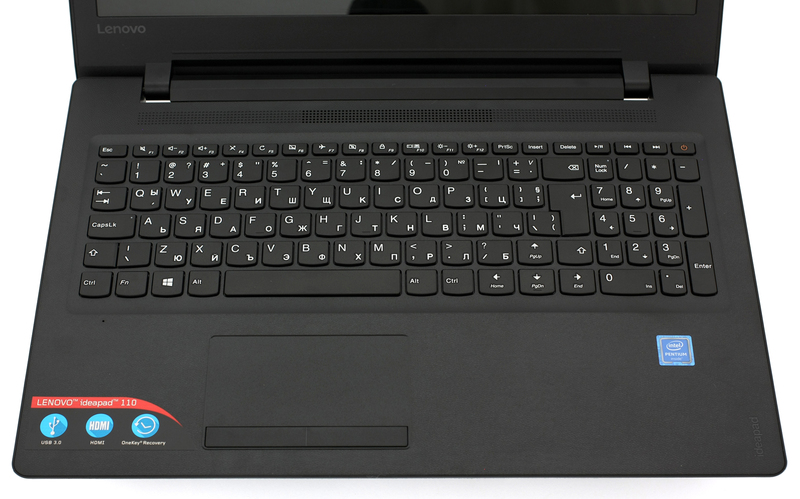 As we stated earlier, the notebook’s chassis has its strong sides and its flaws but we are mostly happy with the presented build quality, of course, considering the price point. The only thing that concerns us is the spongy keyboard and the lack of feedback of the keys. We also can’t miss mentioning the super easy disassembly of the notebook that now doesn’t require the keyboard tray to be removed. The previous Ideapad 100 was a pain to maintain. As far as the hardware is concerned, the Pentium and Celeron configuration will do just fine for education purposes and normal everyday tasks along with browsing. Just make sure you don’t spend too much time away from the charger as the 24Wh battery will only get you less than a few hours of work. The display is also suitable given the situation and will not be suitable for any kind of multimedia activities. However, it will keep your eyes safe due to the high-frequency PWM, which should affect only users with extremely sensitive eyes. So at the end of the day, if you are on a hunt for an ultra-affordable laptop, the Ideapad 110 should be considered if you are ready to make the logical sacrifices that come with the ridiculously low price. But don’t forget to include the Dell Inspiron 3552 and the Acer Aspire E 15 (E5-573), which carry their own perks and drawbacks as well but are still in the same ballpark. Can I run photoshop on this device? Or will it melt? How does this computer perform for basic wordpress blogging? can i use photoshop in this laptop? need to know. lost my cursor, how do I recover it? Is there a suitable printer for this? I hooked up to two printers and neither could establish a connected to print.